Visionary strategist, master communicator, top-notch trainer and facilitator Rebeccah Bennett joins us today! She is the Founder and Principal of Emerging Wisdom LLC. With InPower Institute, a division of Emerging Wisdom, she offers hundreds of programs and events that spur human growth. She teaches participants how to unlock their personal power to create extraordinary lives. Her life and journey is extraordinary as well. The lessons that she shares of her path to entrepreneurship have ... See More given her an awareness and experience that will literally stir your soul. Rebeccah led a successful career in public policy consulting, organizational and community planning and public engagement for over 20 years prior to launching Emerging Wisdom. Emerging Wisdom LLC is a forward thinking social enterprise that helps individuals live empowered lives; assists leaders to build impactful organizations and promotes communities to generate brighter futures. She founded Emerging Wisdom to facilitate shifts with individuals, consciousness and behavior to improve community conditions. - How Rebeccah defines personal empowerment. - Rebeccah was born at the end of the Civil Rights era and raised in a community committed to social justice and equal opportunity. She talks about how empowerment was introduced and defined for her early on and how it evolved. - How she connected her worldview with her career pursuit. - What she learned from her years in the field. - When/how did entrepreneurship enter as an option. - More about the Inpower Institute. - Where does she start with her participants. What do many of us need to understand? Embrace? - Rebeccah has been a consultant, a corporate career woman as well as an entrepreneur with long-standing success with strategy. 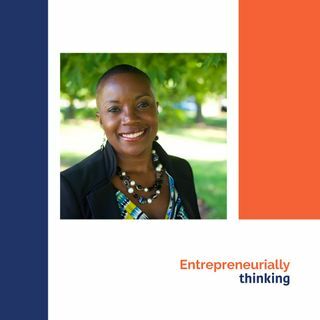 She was part of the Ferguson Commission and part of St. Louis equity entrepreneurship collective with BioStL and more. How does she connect them all? - How does Rebeccah Bennett think outside of the box? - What have been some of her entrepreneurial challenges. Lessons learned (emerged wisdom). - How can an entrepreneur discover and unleash their personal power? How can we use this power to create extraordinary lives?